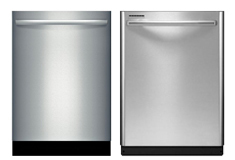 Not all dishwashers get the job done with the same results, to hone on the best dishwashers on the market after going through user reviews and rating the following dishwashers are the most liked. 1. Bosch SHE55M15UC Evolution Full Console Dishwasher with 5 Wash Cycles, 19 Hours Delay Start, XL Flexible Silverware Basket, 2 Cup Shelves and Silence Rating of 48 DBA. 2. Bosch SHX55RL5UC 24 inch DLX Bar Handle Dishwasher With 4 Wash Cycles, AquaStop Leak Protection, 14 Place Setting Capacity, Duo-Flex Silverware Basket & Half Load Cycle For Small Loads. 3. Maytag MDB7749AWM Jetclean Undercounter Dishwasher, 100% Stainless Steel Tub Interior, Auto Clean Plus Cycle, 14 Place Setting Capacity. 4. Frigidaire FPHD2491KF Professional Series Fully Integrated Dishwasher with 5 Wash Cycles, 5 Wash Levels, SpaceWise Organization System, DishSense Technology and Low-Rinse Aid Indicator.